[Athens, October 26, 2017] PRAXI Network, unit of the Foundation for Research & Technology-Hellas (FORTH), and the Secretariat of the ASEM Cooperation Centre for Research, Technology & Innovation (ASEM CCSTI) signed a Memorandum of Understanding (MoU), with the aim to promote bilateral dialogue, exchange of experiences and to enhance cooperation for the commercialization of research. The ASEM CCSTI is hosted in the Beijing Municipal Science & Technology Commission. 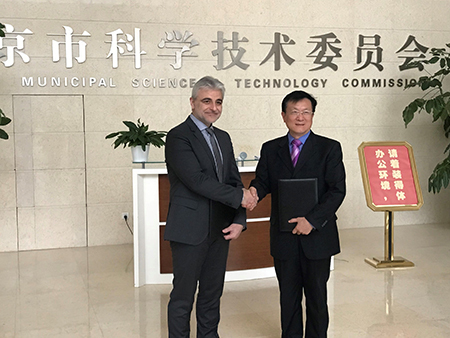 The MoU was signed on Thursday, October 26th,between the President of FORTH Prof. Nektarios Tavernarakis and Prof. Zhu Shilong, ASEM Secretary General, during an official ceremony held in Beijing. The President of FORTH, accompanied by a delegation of researchers, is currently visiting Beijing in order to discuss the details of this MoU which foresees to promote policy setting for exploiting opportunities offered in the two regions in light of the Asia - Europe cooperation, comprising the link between interest groups of each side. In the framework of the cooperation between the two organisations, the European Coordination office of the ASEM-CCSTI has been hosted, since October 2016, at the premises of PRAXI Network in Athens, under the auspices of the General Secretariat for Research & Technology of the Ministry of Education, Research and Religious Affairs. It should be noted that the ASEM (Europe-Asia Meeting) is a forum fostering dialogue and cooperation for Asian and European countries both at technical and political level. A characteristic example of the long-term communication and interaction between Greece and China for joint research and transfer of know-how, is the operation of a joint lab between the Institute of Electronic Structure and Laser (IESL) of FORTH and the Palace Museum of the Forbidden City of Beijing, named “NIKI: China – Greece Laser Technology Joint Laboratory on Cultural Heritage”, inaugurated in July 2016 by the Prime Minister of Greece, Mr. Alexis Tsipras, in the presence of the Alternate Minister for Research & Innovation, Professor Costas Fotakis. NIKI Lab is considered a milestone in the study and preservation of unique museum exhibits, based on pioneering laser cleaning methods for preserving artefacts and monuments of cultural heritage, developed by the Greek institute. Researchers of IESL are presently in China, following invitation of the Chinese Ministry of Culture, in order to streamline further cooperation in the analysis and cleaning of monuments and artworks in the city of Beijing.